Best Dog Brush for Undercoat Review: Top On The Market in 2019! We all want our furry friends to be healthy and cheerful. We feed them, play with them and groom them. In some time, we get to know them so well that we can tell if something is wrong even if there’s a slight change in their behavior or eating habits. The state of the pet’s coat can also tell us if the dog feels okay. Be sure to maintain your pet’s coat and skin regularly and with care. Keep in mind that if your dog’s coat looks neglected and is not cared for, it can give your neighbors or other socially aware citizens a reason to file an animal abuse report against you. The coat can also signify that your pooch may be having some health issues. Don’t hesitate to consult your vet to make sure everything’s alright. Other than that, maintaining your pet’s coat is quite easy. You only need to have the right tools. In this article, I will share some tips on how to choose the best dog brush for the undercoat. First things first, and before purchasing any grooming products, make sure you know your pet’s coat type. Dogs that need the most frequent and thorough grooming are the double-coated dogs. To identify this type of coat, part the fur, and you’ll see it yourself. There should be two types of hairs: the long, harsh ones which belong to the outer coat (also known as topcoat or overcoat); and the short, fluffy ones underneath – they are the undercoat. Sometimes the undercoat and the outer coat are of different colors. The undercoat is usually white or at least is much lighter than the outer coat. See, sometimes it may be not so easy to say what kind of fur your dog has unless you study it in a really profound way. Here is a good checklist – you can consult with it if you’re still not sure what type of coat you’re dealing with. If you still have any questions concerning your pet’s fur, you can ask someone from the pet shop, the groomer, or your vet. Yes, the size of your dog can be crucial. Especially if you don’t want to spend the whole day first brushing it, then washing, then brushing again. And still not being able to get rid of all the tangles and knots. Still, even if your pup is far from being tiny, consider buying both a bigger and a smaller brush. You may need a smaller one to work on sensitive areas or if your dog’s hair is prone to tangles. It may be also easier to operate. But it’s also about your skills, as it might require some time to master the brushes. To keep your four-legged friend healthy and to prevent shedding, brush him or her at least once a month. Although some breeds don’t shed as much as others, most of the dogs with undercoat and\or long hair require regular grooming. Dogs with shorter hair may need less frequent brushing, but their coats are thick and get matted easily. And it can be tricky since the mats and knots are not evident unless you detect them when cuddling. Remember, a well-groomed dog sheds less. And less shedding means less cleaning. Save your time – groom the dog! Please keep in mind that in this article, I’ll be focusing mainly on double-coated dogs. To make sure you’re buying the right product for your pet, consult your vet, groomer or someone from the pet shop. Also, the detangling brushes, as well as any other tools will work more efficiently if combined with the appropriate shampoos and conditioners. Especially when it comes to the massive outdoor heavy-coated dogs. Finally, let’s take a look at some of the dog brushes! 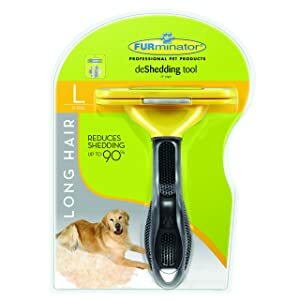 FURminator is probably the most famous and well-known provider of pet-grooming tools. With this double-sided slicker dog brush, you’ll make grooming a breeze. What Type of Dog Is It Good For? It is a 4-inch brush that is suitable for large or medium dogs. 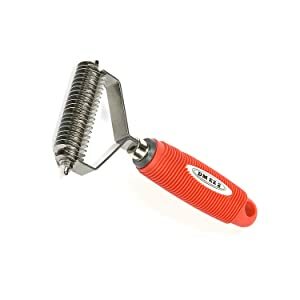 It fits the dogs with long fur since this tool has two different types of long bristles to maintain the undercoat. The curved bristles are useful for eliminating mats and knots, and the straight ones are good for finishing your pet. Start combing your dog from the side with the bent-at-the-end pins, working on smaller areas first. 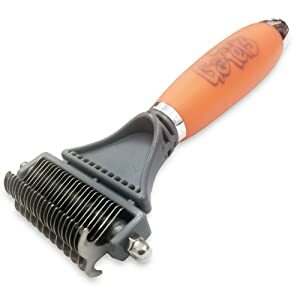 The double-base of the brush is flexible, so you can bend it at any slant when brushing your pet. It is also decently padded which adds extra comfort and safety. However, don’t rip through the coat, or you may cause brush burns and cuts even if the fur is thick. Hold a section of hair and start working on it from the bottom up to the top if the knot is severe. Use your fingers to help it unknot if the brush can’t do it. When you’re done, smoothly work through the entire coat again – this is how you get rid of the excess fur from the undercoat. Use the other side of the brush (the one with straight bristles) to finish grooming. A flexible base is also convenient for your wrist so you won’t feel tired if there’s a lot of work to do. But be careful with the bristles, they are quite fragile and tend to crook rather easily. Apart from that, this FURminator brush for dogs is very practical and efficient! Watch this video to see this FURminator brush in action! Does your pet shed like crazy? Are you tired of constant brushing its hair off your clothes? Allow me to introduce you this 2-in-1 grooming tool. This is precisely what you wanted. And here’s why. What Dog Does It Suit? It is quite a small dog brush compared to the previous one. You can use it on the breeds of all sizes and comb long, medium or short hair altogether. However, please note that the product may be less comfortable for you in terms of application, if you use it on the more massive dogs and also very small puppies – all due to the size of the brush. Still, I recommend you to try it because once you’ve used it, you won’t be able to give it up. Start with the rake, which is the bigger blade. Gently go through your dog’s coat getting rid of all the mats and tangles. The teeth of the rake on this tool are just the right size so the whole process won’t become a torture neither for you, nor for your dog. After you’re done with raking, turn to the other side and go through the entire torso again in steady motions. You will want to work the most on the sides, the belly and the neck of your dog. Don’t forget to hold the hair not to pull it out accidentally and not to hurt your furry friend. The blade of this tool is made of stainless steel, and the handle has an ergonomic shape to prevent it from slipping out. The head of the brush is flexible as it bends to 30° and provides the effortless grooming experience. Although the blades are durable and practical, the handle may get loose from pulling too hard. Also, don’t leave the tool lying bare on the floor to prevent hurting your leg. 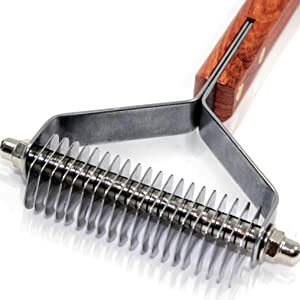 Another name for this kind of the undercoat rake is the stripper brush. The stripper brushes are designed to clean out the excess fur without damaging the topcoat hair. What Dog Is It Perfect For? This particular rake is precisely good for long coated dogs with a lot of undercoat fur. It will also come in handy if you want to take out some hair from any specific areas to emphasize them. Also, using this tool makes the outer coat much easier to manage. 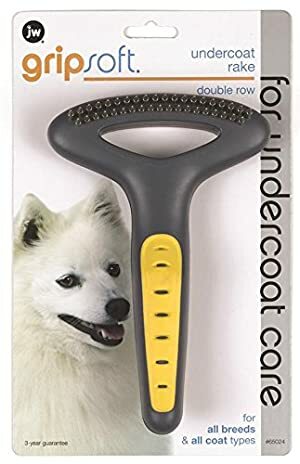 This dog undercoat rake features 20 tines made of stainless steel and a cushioned rubber handle. The tines of the rake are curved in a claw-like manner which makes it super convenient to apply on your dog’s coat. The principle behind this tool is that it detangles and removes loose undercoat without injuring the skin. There are also no extremely sharp edges or blades, so it is quite safe. This gentle rake will take out all the excess fur even from the densest undercoats. Unlike other brushes, rakes produce the least noise. And that is good, especially for fidgety pets who are not used to grooming yet. But they’ll love this rake for sure. And so will you! Watch this video to see how easily the dog lets its owner do the grooming! What I like about Oster tools is their minimalistic design. No wrong lines or accidental details. Everything is in its place. If you don’t mind a slight resemblance to the dental instruments, then this is what you need. Clean, accurate, efficient and safe. What else do we want a practical rake to be? What Dog Is It Good For? This particular model has been designed for larger breeds with longer coats. Just like any good rake, this one is great for thinning, shaping or finishing your pet’s coat. Say NO to shedding. This rake takes out the undercoat like heaven. The tines of this rake are rounded which makes them entirely safe. The shape of the teeth does not allow it to tear through the coat. So don’t be afraid to scratch your fluffy friend accidentally. Still, I will recommend working on the fur smoothly holding it not to pull out what shouldn’t be pulled. Check this time-lapse video to see how much undercoat this rake can actually take out! There are only two reasons that might stop you from buying this rake for your four-legged buddy. You either do not have a dog, or you’ve got a hairless dog. You’ve already seen a slicker FURminator for dogs earlier in this article. But this one is probably the most famous of all FURminator brushes. The FURminator DeShedding Tool. The Queen of the Brushes. What Dog Type Is It Ideal For? This tool is suitable for large dogs with long hair and those who shed a lot. It is comfortable and pleasant to use. It has a bright, friendly design. The blade reaches deep into the undercoat and takes all of the unnecessary, loose hair. Dead fur out! The tiny bristles are put tightly together and are not only great for de-shedding purposes. They also clean off the dirt and can hand small tangles. 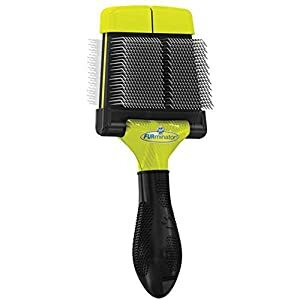 This FURminator brush has proven to provide the best results if used regularly. Meaning that you should thoroughly groom your pet at least once in 3 weeks. It is crucial to use this brush only on a completely dry coat. Otherwise it can lead to injuries. Before using the tool, check your dog’s fur and apply a slicker or a finishing brush to get rid of the tangles and mats. To provide the most efficiency, part the fur, and then work across the entire coat with gentle strokes. This brush features a particular FURejector button, which helps to clean the blade and to a certain point adds to your experience. The thing about this wonder brush which isn’t so good is that it’s incredibly delicate. You should never ever let it fall down. Chances are that the head will break, and the blade can crack as well. The bristles can also bend if you mistreat it. But, apart from that, it’s pretty durable. Of course, as any frequently used tool, it will start to wear down eventually, but you can prolong its life by simply treating it with care. This brush has become so popular due to its phenomenal de-shedding power. And if your dog continually sheds all over the place like hell, this FURminator brush is definitely worth trying. Watch a review of this FURminator deShedding tool and see how much hair a brush can get out! Love it or hate it – these are basically the two options you have with this double row undercoat rake. Let’s have a closer look. What Dog Type Is It Good For? This is recommended for the dogs with really thick undercoat. The teeth of the rakes are designed to work on such undercoats to provide the most prominent results. Also, this may be not the best solution for the dogs who generally loath grooming and get nervous or jittery. If your pup is prone to such behavior during his or her beauty procedures, I’d suggest you go with another dog brush. This rake is better to use on the dry coat. Stroke very gently not to cut the dog’s skin or yourself because the tines are quite sharp. On the other hand, if your pooch likes combing and lets you do it, you can be sure the brush will do its work well. A double row carefully rakes through the undercoat, lifting the dead hair and loosening the mats. But please consider another tool if the mats and tangles are severe – one careless movement, and you might accidentally hurt your dog. Some dog owners say that their pets don’t like or can’t stand FURminator brushes, and that’s how they got to try this one. And, clearly, you can’t be sure whether your dog will be happy with any brush. But, as the dog owner, you are definitely going to be satisfied with the price of this undercoat rake. 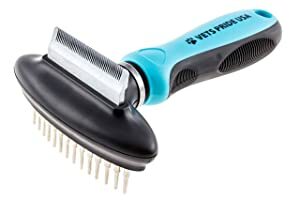 As far as I know, this product has one of the most accessible prices in the market among the pet grooming tools. Now, this beautiful tool has something special, and it reminds of the barber tools. Maybe it’s a wooden handle. Or, perhaps, it’s because of the rake’s strict lines or a perfect row of teeth. A choice you make if style matters to you. This rake is suitable for any type of coat that has an undercoat. The rake works both as a dematting and a de-shedding tool. It will especially come in handy during the shedding seasons. Better use this on a dry coat. With long, careful strokes work through the fur and repeat if necessary. Although its stainless blades get deep into the undercoat, their curved ends prevent scratching of your dog’s skin. Hold it against the skin in the areas where the rake doesn’t go through as quickly. Use your hand to clean the fluff off the blade. Your dog will have an effortless grooming experience with this fascinating rake. 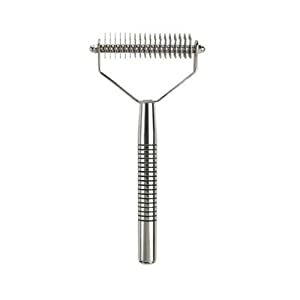 Watch this video for grooming tips on how to use this rake! This is a double-sided rake, which sets it apart from other products on this list. You can use it both as a dematting tool and as a de-shedder. Think about it – there are basically two tools for the price of one – a profitable purchase! 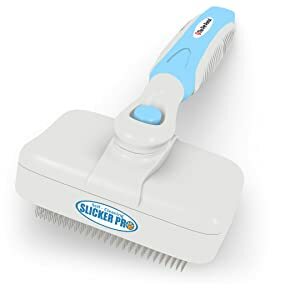 This tool is useful for the dogs with medium or long hair and a lot of undercoat fur that gets so easy to mat. The teeth of the rake are rounded, so there’s no chance to hurt your dog. Use it on dry hair and start with the side that has less teeth. Gently work on the problematic areas in small strokes. When you’re done with detangling and dematting, go to the other side to take out the excess undercoat hair. This rake doesn’t feature blades so it won’t cut the mats out but instead clear them. Also, the tool has a comfortable gel handle that prevents it from slipping out of your hand. Also perfect for cats! For more details, watch this video below! 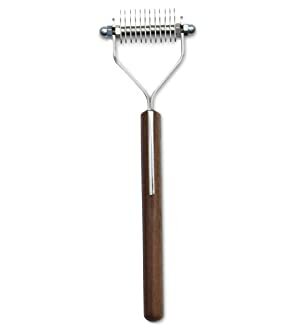 This 2,5-inch rake is made of beautiful steel and a handcrafted wooden handle. It’s a tool with a sophisticated design. Once tried, it makes you want to come back as it’s very handy. This rake features 20 blades and is suitable for most of the breeds, especially the ones with a massive coat. It thins well and works through the undercoat. Use gentle strokes to groom the dog. Start with the shoulders and gradually move down to the torso, unless the whole body is covered. Don’t pull if the tool does not come through quickly. Use carefully on the sensitive areas. PawPamper donates its tools to the animal centers and charities, and that is another reason to like them even more. Pets need to be cared for, and PawPamper knows it. Although this brush looks somehow like a small hoover, it’s not so tiny. There is a particular button that moves away the bristles to let you remove the dead fur from the brush in an instant. The design of this slicker is very welcoming. Let’s take a closer look. What Dog Is It Ideal For? This brush is good for both long- and short-haired pets. Its pins are made of stainless steel. They efficiently remove mats, loose fur and soften the coat. Just brush through the coat of your pet with steady, gentle strokes. When there’s a lot of hair collected on the pins, push the button and simply clean the surface with your finger. This brush has an agronomical handle which makes it comfortable to hold and easy to use. Check this video to find out more about how to use and maintain this amazing slicker brush! Don’t rip through the hair hard if the brush doesn’t come – this may cause the bristles to bend, and there’ll be no way to change them. Also be careful not to leave any burns on your dog’s skin since the pins don’t have safety tops. Other than that, it is safe and comfortable to maintain. Proper grooming is essential to keep your pet healthy and cheerful. Knowing what type of coat your dog has is as important as knowing what he or she likes to eat. A wisely chosen grooming tool will not only save you money. It will also make your pooch super-happy and grateful. At the same time, a weak device can turn the grooming process into a curse. Now that you know about different types of grooming tools and how to apply them, I hope you’ll be able to choose the best dog brush for the undercoat. Treat your pets with care, and they will absolutely love you back twice as much. Delicious Puppy Food for Healthy Development of Your Pet!